The Kids Under Cover Studio Program is such an imperative early intervention strategy in the fight against youth homelessness as 2016 Census data reveals 44% of the homeless population are living in severely crowded dwellings. Many young people are forced out of home prematurely because of an overcrowded living situation, often leading to couch-surfing which can trigger the beginning of years of homelessness. Overcrowding creates a lack of space and privacy. Young people living in severely overcrowded homes often have no space to study, no privacy or stability. Over 51,000 Australians now suffer from severe overcrowding – 10,000 more people than just five years ago. According to the recently released 2016 Census data, it’s mainly families that are affected. Severe overcrowding is much more serious than two siblings sharing a bedroom. The ABS defines severe overcrowding as a home in which at least four extra bedrooms would be needed to adequately accommodate the residents. 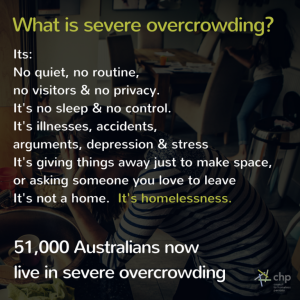 It isn’t well known that severe overcrowding is a type of homelessness, nor is it well known that it’s mainly families who are suffering from it. Perhaps least well understood are the debilitating day-to-day realities of people who live in these households. We’re talking about a family of four sleeping in one bedroom together; multiple families renting a small house together in order to afford rent; large families with six or seven children living in small apartments; houses in which people are sleeping in the dining room and living areas. In households that are severely overcrowded, the privacy, health, mental health and safety of occupants are all at risk, as is the ability for them to meaningfully engage in; work, job-hunting, education, relaxation and social activities or any number of normal or necessary activities. In the worst cases, overcrowding can exacerbate domestic violence, depression, and the spreading of diseases. 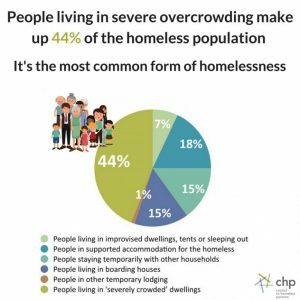 People who fall into the category make up 44% of the homeless population – making overcrowding the largest, but perhaps the least well-understood form of homelessness. What are the effects of overcrowding? Living and dining areas, and sometimes garages and storage areas, are re-purposed as sleeping spaces for multiple people, sometimes including extended family. Children living in severely overcrowded homes often have no space to play, study and develop. With multiple people of different ages bedding down in limited spaces, children are also forced to be witness to the stressors of the adults’ world. Newborn babies and adults sleeping in the same room as teenagers who are completing high school can lead to challenges on a number of levels. Living in a severely overcrowded dwelling means a young person has no quiet space to read or study. Sharing a room with five or six people, including adults, leads to disrupted sleep, and in turn poor concentration at school and non-attendance. As with all forms of homelessness, severe overcrowding makes it almost impossible to conduct normal social relations. It is difficult for a child to have friends over when there is no space to play, a reluctance often compounded by feelings of shame about their living situation. Adults are also deprived of the simple pleasure of hosting friends or family. Chronic lack of sleep caused by dysfunctional living arrangements leads to fatigue and stress affecting work, job-seeking or study. For everyone, it results in tension and fractious relationships. A UK study from Shelter found that 77% of people living with overcrowding said that it harmed their family relationships. 86% said that depression, anxiety or stress in the home was caused by the overcrowding. Overcrowding is a continuum. Short periods of overcrowding or slight overcrowding may not have any serious impacts upon people who live through it. But, overcrowding that is severe and/or continues for a long period can have serious consequences. Who is affected by overcrowding? There can be a misconception that overcrowding is mainly experienced by students living away from home, however, the data tells a very different story. Of the 51,000 people living in severe overcrowding at the time of the 2016 Census, only 13% were enrolled in tertiary education, either part-time or full-time. While students are definitely one of the demographics bearing the brunt of the housing affordability crisis, the numbers tell us that bulk of overcrowding is happening to families, Indigenous Australians and recent migrants. Even within same-family households, restricted access to space and utilities and, lack of privacy can be seriously detrimental to people’s ability to participate in work, study and socialising. It can also give rise to conflict. This is why overcrowding that isn’t ‘severe’ by definition is also precarious, and, can give rise to other forms of homelessness. Many young people are forced out of home prematurely because of an overcrowded living situation, often leading to couch-surfing which can trigger the beginning of years of homelessness.